SellerZen's versatile platform allows you to map your Amazon Seller SKUs to any QuickBooks Inventory Item Name. Additionally, you can assign classes to each product, and you can specify whether or not to track income and fees. Whatever your use case, you have SellerZen map your Amazon inventory to your QuickBooks Online inventory. Even if you have a class assigned on the inventory item in QuickBooks Online, you'll still need to assign the class on SellerZen. 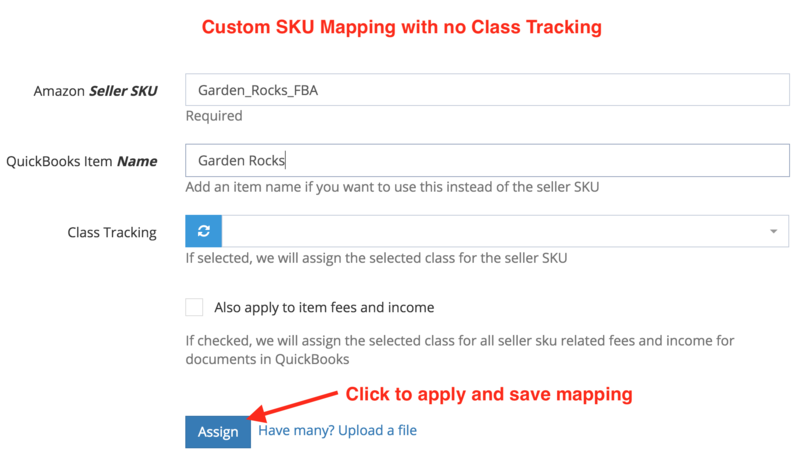 If you're just mapping your Amazon SKU to an item in QuickBooks Online, then you can ignore all the class tracking options. Simply click on the Add New button to bring up the mapping option. 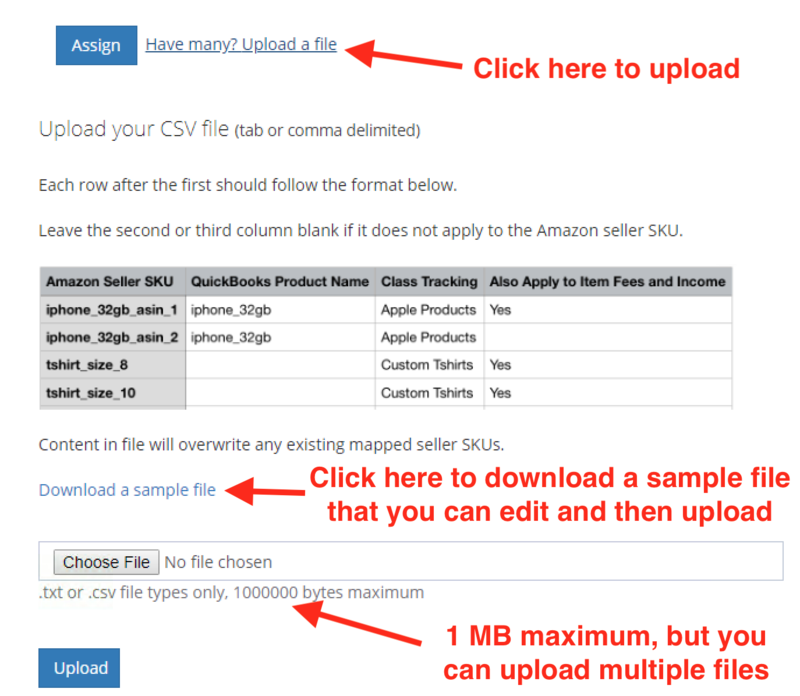 Enter the Amazon SKU and enter your QuickBooks Inventory Name to link the two. Each time a transaction with that Amazon SKU occurs, we'll use the QuickBooks Inventory item you mapped on the QuickBooks document. Once you click on Assign, you'll see all mapped items below. If you want to enable class tracking, then you'll have make sure Classes exist in QuickBooks Online. Once you've enabled class tracking and added any necessary classes, you can then add class tracking to your custom SKU mapping. If your Amazon SKU and QuickBooks Inventory Name are the same, then you'll just need to add your Amazon SKU and select the class and whether or not to track fees and income. Leave the QuickBooks Name field blank if the Amazon SKU and QuickBooks Name are the same. 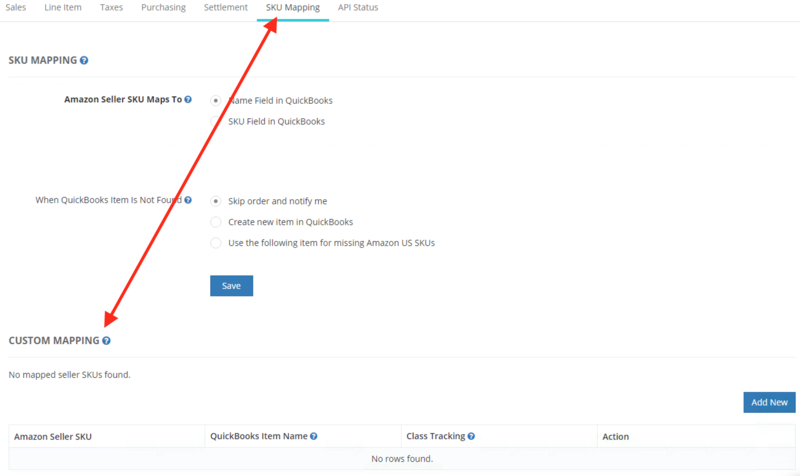 If they are different, then enter the Amazon SKU, the QuickBooks Item Name you want mapped, and select the class and whether or not to track fees and income. Once you're done, you'll see a list of all mappings below. Make any necessary changes. 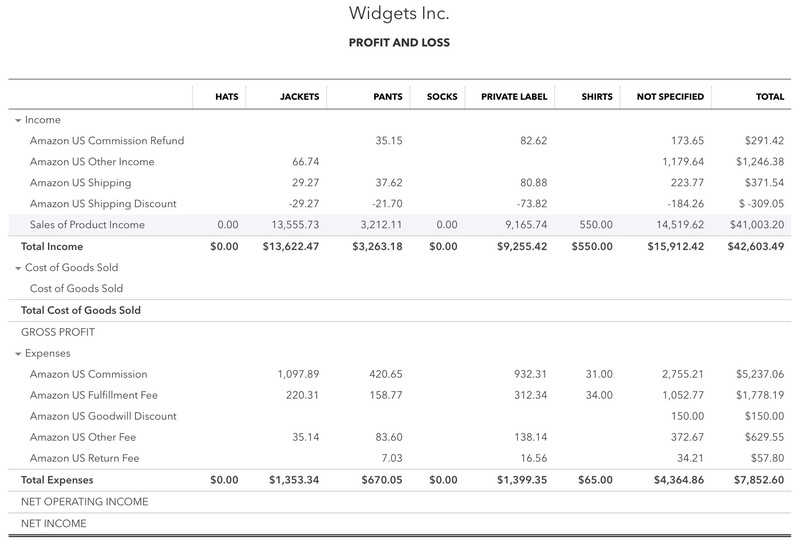 Here's a sample Profit and Loss report in QuickBooks Online with class tracking enabled. For this case, items were assigned classes like Hats, Jackets, and Pants so that reporting would show income and expenses for each category. This is helpful for sellers who sell a broad range of products across multiple categories. Income and fees are separated (if the option is checked) to show profit per class. Similarly, sellers may want to use categories for consignment sales. So instead of "Hats," sellers can have "Client A." By doing this, all income and fees will be separated by clients. This helps with fee calculations for consignments. If you have a lot of items, you can always create a spreadsheet using any free spreadsheet like Google Sheets to create a file to upload to SellerZen. We'll process the file and send you an email when it's complete, along with any errors we find. Use our import option to import a list of SKUs at once. Each file should be no more than 1,000,000 bytes or 1 megabyte. You can map up to 10,000 items. If you have more than 10,000 items, please contact us through chat or at info@sellerzen.com. The file be a plain text file (.txt) or a comma separated values file (.csv). You should have the Amazon Seller SKU in the first column, QuickBooks Online Product Name in the second column, Class Name in the third column, and Yes or leave blank in the fourth column. You can upload up to 2 files at a time. We'll send you an email once we've processed your files. You can then review your mappings before you start the sync. You can review the mapped settings before continuing with integration.